【ATHLETIC/SLIM FIT】Order a size larger if you like a looser fit. Size chart next to product image. Show your support for President Trump as he builds the wall. Make America Great Again! 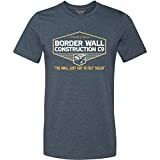 Shirt features phrase "Donald J. Trump Border Wall Construction Company--The Wall Just Got 10 Feet Taller."